13 tracks, including a Motörhead cover, featuring a special guest on “Brand New Day”: Luigi “Sange” Sangermano from Sange:Main:Machine. 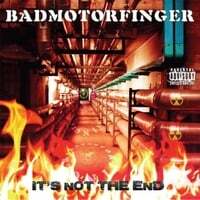 No frills, no “recording studio” extras: Badmotorfinger is a live band and its members wanted to recreate that “live” atmosphere on the album. Modern hard’n’heavy, with melodic catchy refrains that get stuck in your head since the very first listening: an incredible mix of technique and emotions. In the album you’ll find easy rock’n’roll lyrics like “Rebel”, “The Fear” and “Loser”, but also lyrics that deal with important subjects such as “Afterlife”, about the human need to believe in something beyond death (inspired by a walk in Brompton Cemetery in London), or “Beginning Of The End”, about the hope that still remains, despite the political decadence that leads the world to an inevitable end. The song “Nightmares” explores the inner fears buried in our subconscious, those fears that bring the mind on the edge of “Inside Insanity”; “No Second Chance” spits out all the rage and disappointment for the “so-called-friends”. The track “Ghost” has evocative lyrics, like “Ride The Storm”, a song that opens a window onto Tesla’s futuristic genius.